The concept of using mushrooms as anything other than delicious additions to an omelet, pasta or pizza—or, as Michael Pollan suggests, as a way to shift consciousness and shatter your ego—might be new to you. Mushroom in pill form? In tea form?! Well, it’s definitely time to open your eyes to the incredible powers of certain fungi and consider incorporating them into your health routine! There are many mushrooms that have adaptogenic, healing powers, including Lion’s Mane, cordyceps, and reishi, known as the “queen of mushrooms.” But chaga, my current favorite, is known as “the king of mushrooms” for good reason: it is thought to have anti-inflammatory, antioxidant, cancer-treating and -preventive, liver-protecting, and immunomodulating properties. Chaga’s origins are unique in that it grows on living Birch trees (many mushrooms are saprotrophic—that is, they grow on dead trees), and takes around 15 years to mature, forming and concentrating many nutrients during that period. According to infectious diseases physician Dr. Merry, writing for Healthy but Smart, “The Chaga mushroom survives seasonal environmental stresses, including freezing temperatures, UV irradiation, and the invasion of pathogens and, as such, has evolved with complex, integrated defenses.” It is these defenses that confer the mushroom with adaptogenic health benefits. It is also this history of “overcoming adversity” that makes chaga such a powerful qi-strengthener and nourisher in traditional Chinese medicine. A number of studies suggest that certain elements contained within chaga (namely, triterpenoids) may have anti-cancer effects specifically on colorectal, lung, and cervical cancer. These triterpenoids have been shown to inhibit the proliferation of and cause apoptosis (cell death) of certain cancer cells. And a 2011 study in Molecules and Cells found that polysaccharides derived from chaga had immunostimulating effects on mice and even suppressed the growth of melanoma tumors in tumor-bearing mice. Aside from triterpenoids and polysaccharides, chaga is also incredibly rich in antioxidants—in fact, it’s the second-most antioxidant-rich food in the world!—and these antioxidants go to work by protecting your cells from free radicals, which cause damage to your cells and DNA. In addition, chaga is rich in beta-glucans, sugars present in the cell walls of the fungus that have been proven to act as natural biological response balancers for immune support by aiding in the production of T-cells and macrophages. So in other words, chaga has potentially a number of powerful ways of fighting cancer: deploying antioxidants to fight free radicals and prevent the development of cancer in the first place; arresting the growth of tumor cells; killing tumor cells directly; and activating the immune system to kill tumor cells. Chaga has extremely high levels of superoxide dismutase (SOD), an enzyme found in all living cells that provides powerful free-radical protection (aiding in the cancer-fighting mentioned above), prevents tissue damage, and ultimately help to slow down the aging process. And according to Bess O’Connor, certified ayurvedic and holistic health practitioner, about 25% of the pigments in chaga are melanin. Melanin is what gives color to your skin and prevents against UV radiation, so this alone makes chaga a powerful elixir for the skin. Because of these skin benefits, chaga is also used as an ingredient in many topical creams, soaps and face washes. While this may be your first time hearing about chaga, the mushroom has actually been used as a folk remedy for more than 4,000 years, mainly in Russia, Japan, Korea, China, Alaska, Canada and some parts of Scandinavia. It is a staple in traditional Chinese medicine, appearing in the Shen Nong Ben Cao Jing, the famous, ancient Chinese medicine book, where it is described as a superior class of herb, because of its ability to strengthen all Three Treasures—the three essentials for sustaining life: jing (essence, growth, reproduction); qi (life force, energy); and shen (spirit, mind). As mentioned above, the way chaga grows informs its powers and benefits when used as a healing herb: because it must withstand very harsh conditions, growing as it does in far northern climates, it develops important defenses and invulnerabilities, which are transferred to you when used as a tonic. According to TCM, chaga has a cooling effect on the body, and nourishes elements of the digestive tract, notably the liver, spleen, heart, stomach and kidneys. It calms the mind and supports defensive qi (the energy that protects you from harmful pathogens). I love to make chaga tea, and have been drinking this every afternoon! 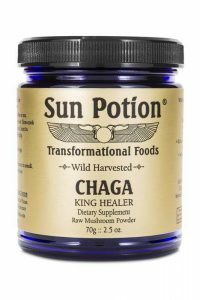 Sun Potion’s Wildcrafted Chaga Mushroom Powder is my favorite, but the powerful herb is popping up all over and there are a number of brands carrying it these days. 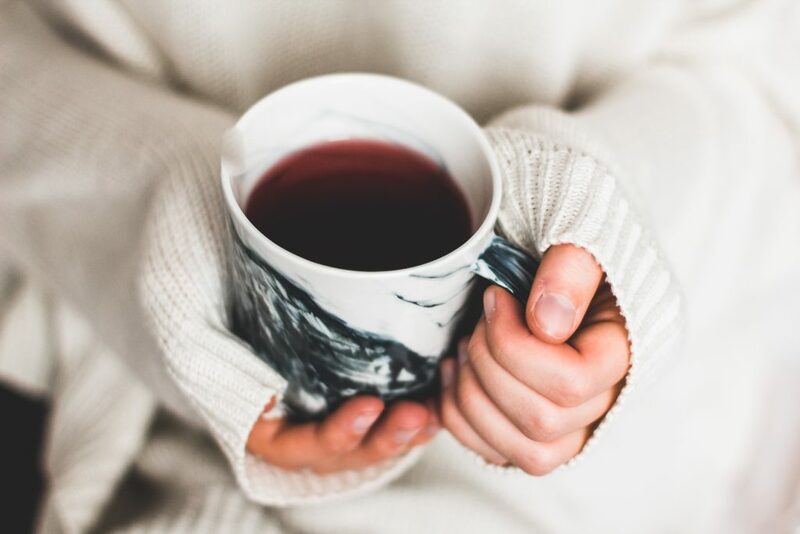 The traditional way of drinking chaga tea is by simmering it at a low temperature (to protect all the proteins and healthy compounds from breaking down) for 6-8 hours—not an easy task if you are on the go! The other option is just to drop a teaspoon into the hot beverage of your choice: chai tea, latte or even oatmeal. Sun Potion also links to a fun, caffeine-free dandelion root latte recipe made with chaga. This entry was posted in Chinese Medicine, Herbs & Supplements, Thrive and tagged chaga, dandelion root latte recipe, herbal medicine, Immune-boosting, King of Mushrooms, medicinal mushroom, Qi-strengthening, Sun Potion's Wildcrafted Chaga Mushroom Powder, TCM, tea.